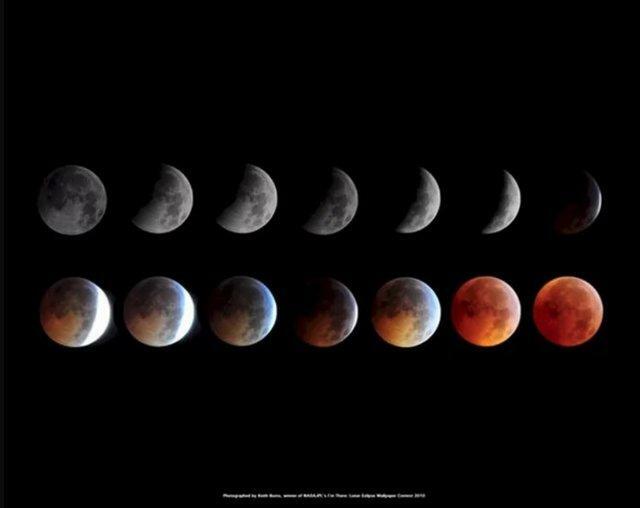 Miss the last total lunar eclipse? Don’t worry, another one is happening this month. Look to the skies on Jan. 20–21 for the supermoon total lunar eclipse, with a full 62 minutes of totality! Hopefully the skies will cooperate for when the full wolf moon does its slow dance through Earth’s innermost region of its shadow, also called umbra. The fun starts when the moon slips into Earth’s outer shadow starting at 10:33 p.m. on Jan. 20. The total lunar eclipse, a completely red moon, starts at 11:41 p.m., and the total lunar eclipse maximum occurs at 12:12 a.m. on Jan. 21. If the Earth had no atmosphere, the moon would completely disappear within its shadow and we would not see the glorious red glow. Due to Earth’s atmosphere, cooler colors are scattered away by the atmosphere, leaving the warmer ones to filter in and we see the moon in warm colors. The color of the moon’s intensity has much to do with the state of the Earth&apos;s atmosphere. By 12:43 a.m. on Jan. 21, the total lunar eclipse ends and you will see the eclipse run in reverse; as the moon slowly dances away from being in Earth’s shadow. From start to finish, the event lasts a little more than 5 hours. You may also notice the moon appears larger than normal while viewing the eclipse. In fact, it is! During the eclipse, the moon is closest to the Earth, known as perigee. It is called a supermoon because the full moon comes within 90% of its closest approach to Earth as it revolves around our planet. If the weather doesn’t cooperate, you can watch the eclipse via live stream at TimeandDate.com and SLOOH. Curious about the night sky? Please remember the “skies” are always clear at the planetarium in the Museum of Natural History located in Roger Williams Park. During January and February there are planetarium shows at 1 p.m. and 2 p.m. on Saturdays, and at 2 p.m. on Sundays. Please visit the museum&apos;s website for more information.